Monika In Polen was Gudrun Gut's contribution to the monika 10th aniversary compiltion Monika Bärchen: Songs for Bruno, Knut & Tom. Her new online release, Apples, Pears & Deer in Poland includes an exclusive Thomas Fehlmann remix of this cracking track plus 2 brand new Gut compositions which are also only to be found on this EP.Monika In Polen, is a true monika-style number with oldschool samples of polka and yodelling. Gut's impressive solo album I put a record on (monika55) came out in 2007 and, as you might guess from the title Monika in Polen, this track is inspired by a Monika night in Poland.Besides his collaborations with Gudrun Gut on the oceanclub Thomas Fehlmann is famed as a "floating" member of The Orb as well for his work as a solo producer and DJ. For this EP he has woven his shuffle magic on the already very danceable tune making it a prime cut for the dancefloor. 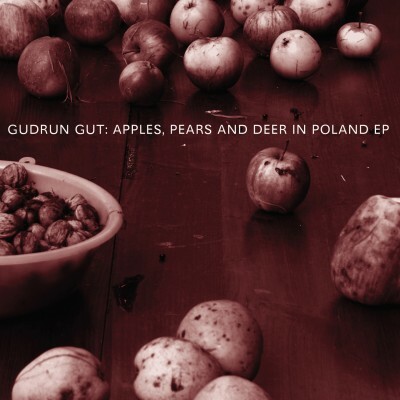 On top of the Fehlmann mix of Monika In Polen, Apples, Pears & Deer in Poland contains 2 exclusive new Gudrun Gut recordings developed out of her live performances. The first begins with the sound of a car out on the open road and develops into a downbeat industrial groove, she takes her time with it and ends with horses hoofs rattling, while Harz4Schleife tells the story of roaming through the countryside.All these tracks are available exclusively on this online EP release. Following her acclaimed 7"s on Earsugar, Move Me and Pleasuretrain, Apples, Pears & Deer In Poland is a fine new EP from monika enterprise label founder Gudrun Gut.